After two and a half years in early access, Alien Trap’s sci fi roguelike has finally been released and I am pleasantly surprised and happy that I returned to this game. Over the years, there have been some ups and downs with the whole early access program. When it first launched on Steam, I and many others were excited to take part in the development in new games, get them cheaper and earlier than otherwise possible. It didn’t take long, though, before some clouds started to emerge. Some projects never got finished and some fell under some questionable practices like ARK releasing an expansion before the game even being finished. For me, the biggest problem has been that once the game is finished I have often moved on to other games and seldom go back for any length of time. I’m glad I did so with Cryptark. When I first played Cryptark, I thought it was an okay but somewhat bland game. I loved the sound effects and the weird alien art style but it ultimately didn’t stick with me. Back then, a story mode was in place, and it is similar now, but greatly expanded. You play as a salvage team which goes from sector to sector and enters old derelict spaceships for scrap, technology and upgrades that culminates in the titular Cryptark ship. In each sector, there are four different ships with different rewards and difficulty to chose from – when you’re done, you move on to the next sector. Once you have chosen which ship to plunder, you get to pick a loadout. As with many roguelikes you start with pretty simple gear – you get to upgrade and replace them with bigger, meaner weapons during the course of the game. Before you launch into space you also have a chance to test any of your new toys out, which is welcome since there are a lot of them and the more you bring into a mission the higher your upkeep cost will be. When the game begins proper, the objective is basically to take out the ship’s AI cortex: a big fleshy motherbrain. In your way there are weird Geiger-esque drones, turrets and environmental dangers. To throw another hurdle at you, the ships usually have secondary systems. Some, like shields, repair and alarm systems are all but necessary to take out before tackling the cortex but others like turret and drone control can make it a lot easier for you to traverse the level. Moment-to-moment combat is handled like a little more slow-paced and tactical twin-stick shooter. Move with the left stick, aim with the right and use triggers and shoulder buttons for weapons. It works well enough, but I feel the controls could be tighter – if you are going to play Cryptark, I strongly recommend using a gamepad as I find the keyboard and mouse alternative hard to handle. The level design is pretty good and plays like a tactical puzzle you need to solve, the systems are usually codependent and you need to plan out where you want to make your entry and what order you will tackle the level. Add to this a timer and a desire to get as many gear pickups as possible before you leave and you have some real work cut out for you. The enemies are varied and devious and it is pretty easy to find yourself getting bogged down and swarmed if you are not careful. As if that wasn’t enough, there is also an extra layer of secondary objectives that are sometimes mundane, like don’t use grenades and are sometimes just sadistic like limiting your health to 3 or loadout to a ridiculously small amount. All that extra cash is important, too, since it basically determines how many runs you get to do at the endgame. It feels a little like another sci-fi roguelike called FTL where you basically progress in order to prepare yourself for the big baddie in the end. If you die, you get to respawn but you lose money and once that is gone you lose your scavenging contract and the game is over. The game also has a couple of other modes you can try out. Rogue is even more of a roguelike experience. It removes the loadouts and money part of the game and you no longer get to pick the next level. In its place there are more weapons and upgrades on the map. I think I prefer this way to play since it removes the pressure on money and also the time limit; you can really take your time and plan out which way to go. It is, of course, a lot harder since you only get one life and damage carries over from level to level. On top of this, there is a co-op mode and a Cryptark excavation mode once you have beaten the game. Graphically, the game looks very nice and is the fundamental that has changed the most over its development. It looked okay before, but now there are extra filters and effects layered on top that just makes it more colourful – it all pops a bit more than before. My favourite effect is the way the machine gun feels, looks and sounds; it just has a meanness to it that I like. The best aspect -design wise- are the short animated quips between missions or when you find something interesting in the level. They are really good at portraying the personalities of your crew and can actually be pretty funny at times. The most important things in a roguelike are challenge and variety. It needs to be hard and it needs to feel fresh and keep surprising you. In this area, I think Cryptark is mostly successful: there are a ton of weapons and gear, from mini nukes to tasers. During the course of the game, you also have the opportunity to unlock additional characters that not only determines your starting loadout but also things like how many weapons or items you can carry with you at all. 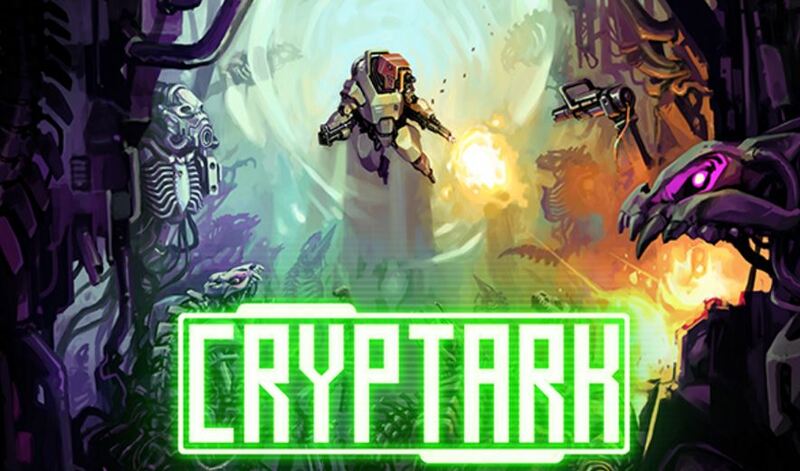 Cryptark is, without a doubt, a challenging game but refreshingly it makes some of the challenge tactical and strategical. The ship systems are often codependent and act to protect each other,like shield systems shielding repair systems from damage from damage and once you take out the shields you need to hurry and knock out the repairs before it brings things back online and so on. If you dont device some sort of loose game plan for how to take them out you will undoubtedly fail and die. Where the game stumbles a bit is in its aesthetic variety. While the enemies have a nice look and feel to them I can’t help but feel a bit tired of them after a couple of runs. It would have been really nice to see some other type of robots or alien make an appearance as well for variety’s sake. Cryptark is an excellent roguelike with a nice look and feel to it. If you’re not completely tired of the genre yet, I recommend that you check it out.